BLOX Extended Wheel Studs UNIVERSAL - Dezod Motorsports Inc - Home of the automotive performance enthusiast since 2002. BLOX Racing extended wheel studs are manufactured from high-strength, forged alloy steel. These extended wheel studs are designed and intended to be used with BLOX Racing open-ended lug nuts on racing slicks or when wheel spacers are required. BLOX Racing wheel studs are all heat-treated and coated and withstand the rigors of acceleration loads and lateral forces. 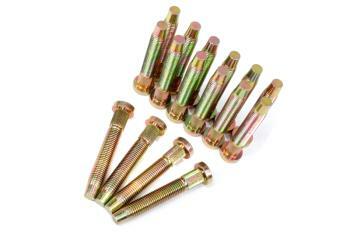 Extended wheel studs are available in sets of 16-pc and 20-pc. Single-piece wheel studs are available and are ideal for when replacing only a few old or damaged studs. NOTE: Wheel studs must properly be pressed in using a mechanical or hydraulic press.